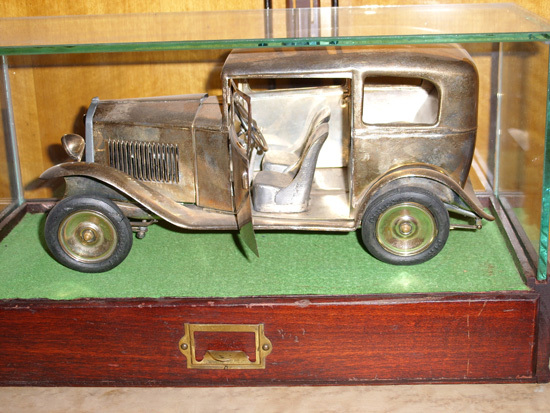 This rare toy, a silver model of a 1932 Fiat Balilla two-door sedan still has a lot of salesmanship left under the hood! Complete with solid Pirelli tires, it was formerly in the collection of Baldacci Lapo of Florence, a noted Italian automotive memorabilia collector. This example exhibits tarnishing, but overall is a very nice example. Under the hood is an alloy static engine. This model measures 12″ x 5-1/2″ x 5-3/4″ and comes complete with a custom-built glass case on a mahogany base containing a sectioned drawer. Silver model cars remain highly collectible and this is no exception..